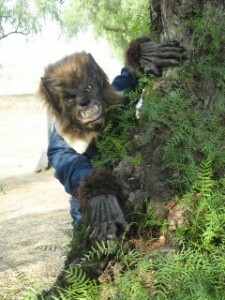 Looking for a Cool Monster Costume? My computer died almost two weeks ago. Dr. Techiestein brought it back to life just in time for Halloween! So here’s a tricky treat for anyone looking for a winning monster costume. I would have posted this sooner, but dead computers don’t cooperate. The top part is built on the frame of a backpack – the kind hikers use, not a book bag dealie. He fitted a long sleeve shirt over the frame, stuffed it, attached a full-head monster mask, slipped a long black robe over the shirt, attached huge monster hands to look like they’re holding the red box, which has a hole cut in it to fit your head inside. You’ll need to wear another long black robe and keep your arms hidden. Wear the backpack as snug as possible to support the weight of the stuffed monster. Tie a black cape tied around the monster’s neck to conceal the backpack and pin the cape to your robe. Voila! It was about 7 feet tall and a real-attention getter. If you make one of these, I’d love to hear how it turned out. Here’s another little treat for you. Check out this jack’o’lantern carved by Steve Attkisson. How clever! dreamt up by a dreamster! What are you doing to celebrate? For those of you venturing out into the night, stay safe. Awrooo! This entry was posted in Creepy, Holidays and tagged Uncategorized. Bookmark the permalink. 11 Responses to Looking for a Cool Monster Costume? I hoped you wouldn't miss your Halloween post! Whew, just in time. The computer gods/Halloween spirits were with you. :PThat, by the way, is a very cool costume. Tough getting through doorways, though. Happy Halloween. We're just doing the usual: watching a movie and handing out candy. Hahaha…. that's a great costume! Glad you got your computer back in time for Halloween! I love Halloween!!! Very neat costume. I always worry about scaring the little ones though. I love our decoration – the blow up lawn one that looks like pacman chomping ghosts, but he's a jack-o-lantern and the ghosts are… well ghosts. 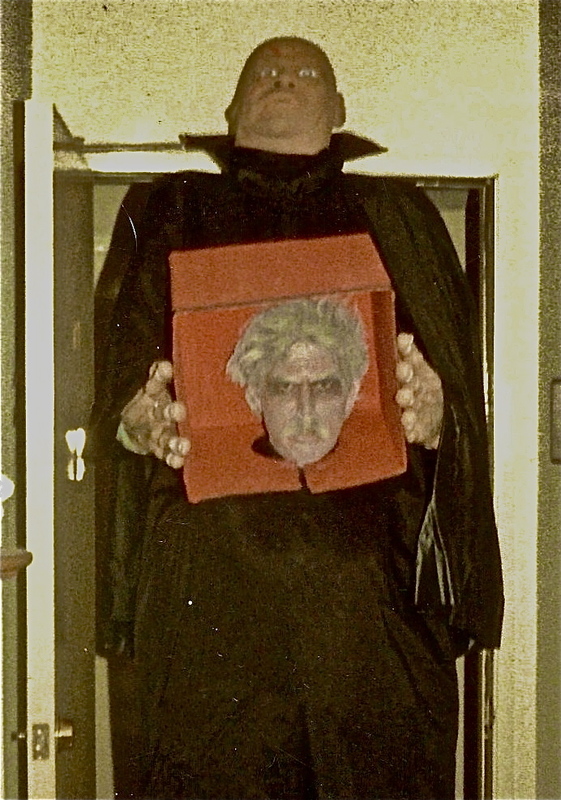 Your husband's costume from 1984, seems a lot of work but I am sure it will be worth the effort for my kids to show off to the babies. 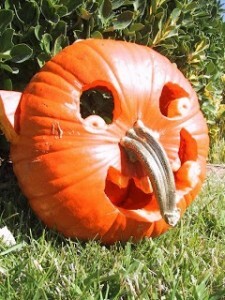 The Jack O' Lantern is an easy twist ( I mean the nose).I like your poem ! We did not get any trick or treaters yet. We may have an other day set for Halloween as there are unsafe down wires every where in New York, New Jersey and Connecticut from Saturday's storm. We got the power back after forty hours, but a lot of people did not. I feel bad for kids as we have a lot of candy, oh well. That's an amazing costume! We're not that big on Halloween here. I used to like going to a themed dance. Some people who went to them really went all out with their costumes.On my home, I did see several kids out with their parents tonight though, and one garden done up like a graveyard! That is one heck of an amazing costume! Cool costume. Love the pumpkin. Thanks for all your comments, Blogger Buds. It feels so good to be back online. A bit overwhelming trying to catch up, but so good to be back! What a cool costume! Gives me ideas for next year. Thanks for sharing.And I enjoyed your poem.